Spring sunshine and milder temperatures… what a joy to have some sunny weather at last! This weekend marked the first day this year of being able to go out without a thick coat, scarf and three pairs of socks tucked inside boots (well it seemed that way at least). I may not have embraced spring colours – choosing a whole load of black and white with olive green instead – but it was great to bare just a bit of skin and soak up the sun. We defied the rules of photographing outfits and took these in the direct sun – my olive green trousers seemed so much lighter and brighter out of the shade. Although the white of the two-tone sweater was somewhat blasted with light, it was just about saved by the thick ribbing which added a little detail to its brightness. Sometimes you gotta break the rules with photography (a bit like style I guess) to make it work for you. One other trick I tried: the necklace hair tuck. After fooling quite a few of you (unintentionally!) the other week with my faux bob/sweater hair tuck, I simply left my hair inside my bobble necklace. I rather liked the slight hair mess it made, and it added a touch of femininity to an other masculine chic outfit. Do you have any tricks to add a touch of femininity to a masculine outfit? Are you a fan of masculine chic like me? Do share in the comments! I adore this outfit. I have always loved this sweater (very much), but combined with those green trousers and fabulous shoes… brilliant. As for femininity (not an easy word) with man-outfits… I have a hard time. You need good and long hair for that. Which is why I do not wear a man-outfit too much. I have beautiful orange brogues but need a stylist to wear them. I really like this outfit! I love the hat and the shoes. I like the photos, good for you for bucking the photograph system, haha. LOVE you in that HAT!!! Really though I am obsessed with the color of those pants!!! Fabulous!!! 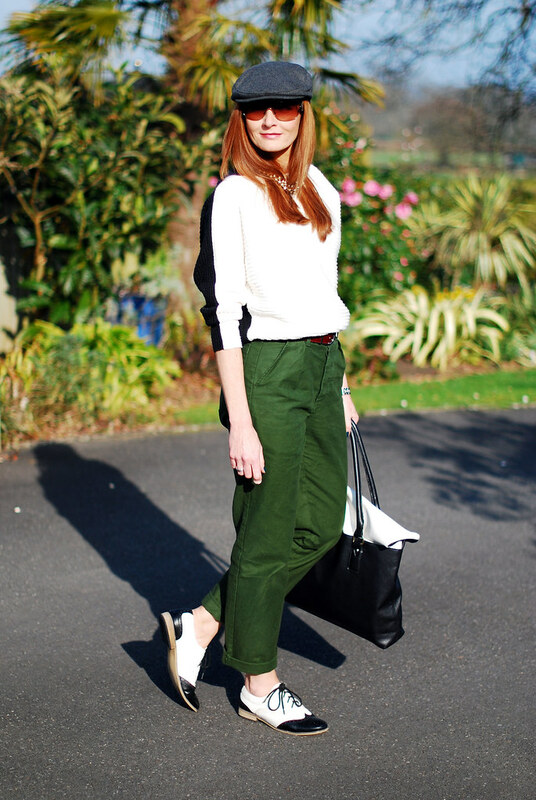 I love the shade of these trousers! And this newsies cap is too cute on you! Another great look! 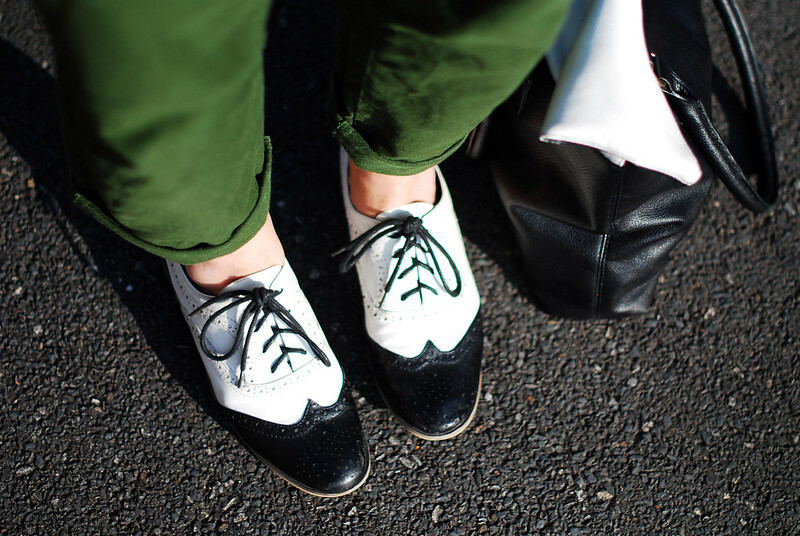 Love the brogues, the cap, the nail polish – great attention to all the little details that make a look unique! So happy to have discovered your blog! I love this combo, the colors the style just so unique and chic. Saving this to my inspiration folder. I'm so happy you did take the photos in the direct sun, it looks so warm and wonderful! It's been such a gray winter that I'll take all the sun I can get! Love the shoes, by the way! I'm so in love with this! Those brogues are gorgeous! I have a black and white pair that I may need to style like this! Thanks for the inspiration. Visiting from Sunday style. I LOVE the color block top and the hat! You look great! so nice outfit I'm in love with your oxford shoes! What a great look, Catherine! And that hair tuck works well on you. I used to like the masculine look from time to time. My long, blond, curly hair makes it feminine right away. Also adding some accessories does the trick. Since living in the tropics I have not gone for that look in a while now. Oh, and I see flowers too! I'm jealous of your weather… But most importantly, I LOVE this outfit. All the black and white is just great. You suit khaki as you're warm skinned and I love the hat and glasses. Very stylish and individual. Lovely day for photos too! I just got my khaki trousers out again as I haven't worn them for quite a while. Glad you enjoyed the nice weather, I certainly did, it is amazingly warm and sunny here. Gorgeous brogues and manicure! I love your look! 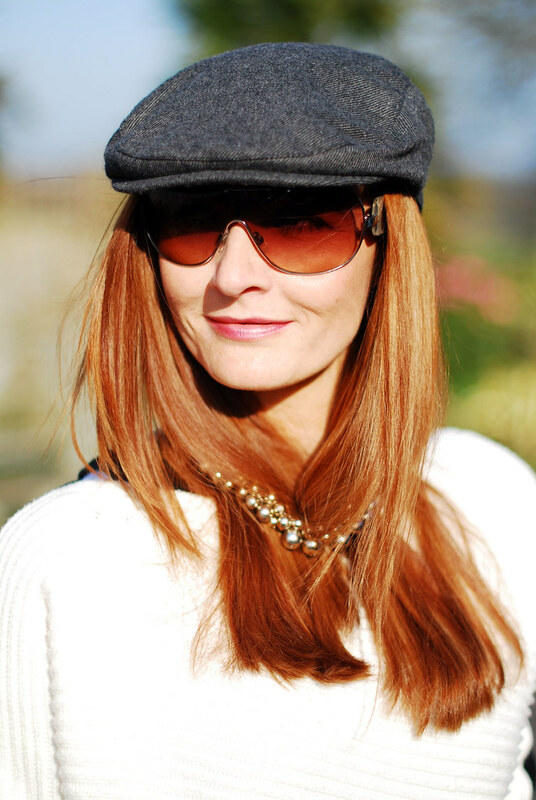 This is by far my favourite look for spring, nice edge to it and the cap makes it look cheeky! Nice ensemble!